Ale Fest 2013 | Season It Already! Posted on December 10, 2013 by Carrie @ Season It Already! A few months after we started dating, Rob wanted to teach me more about beer. So on our of our dates, he threw an “Ale Fest.” He bought a series of beers that were unique and new-to-me. This was ten years ago. Rob and I have been trying to recall what beers we tasted back then. I knew one of his favorite beers at that time was Fullers ESB, but I’m sure he had me tasting that well before Ale Fest. And the closest thing we had to local microbrews at the time was Summit. Rob was lost not having any of the variety that he had while living in Seattle. I recalled tasting some beers from Unibroue, a Barleywine and maybe something festive or with a vintage. 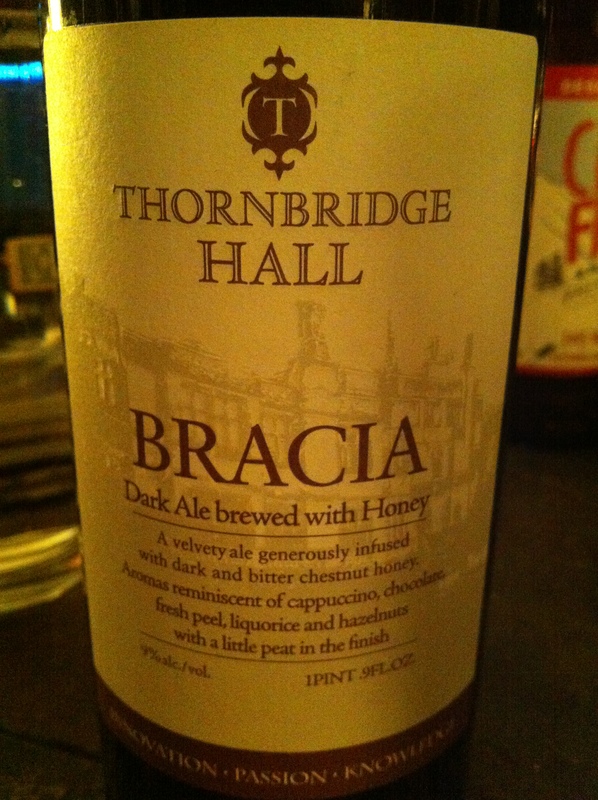 So why am I telling you all of this… my vague recollections of Ale Fest 2003? When it comes to our personal Ale Fest – there are NO rules! Just as Rob did for the original Ale Fest, we picked whichever beers spoke to us from the shelves. Or they just jumped into our basket. Yes, those are pretty animated beers. 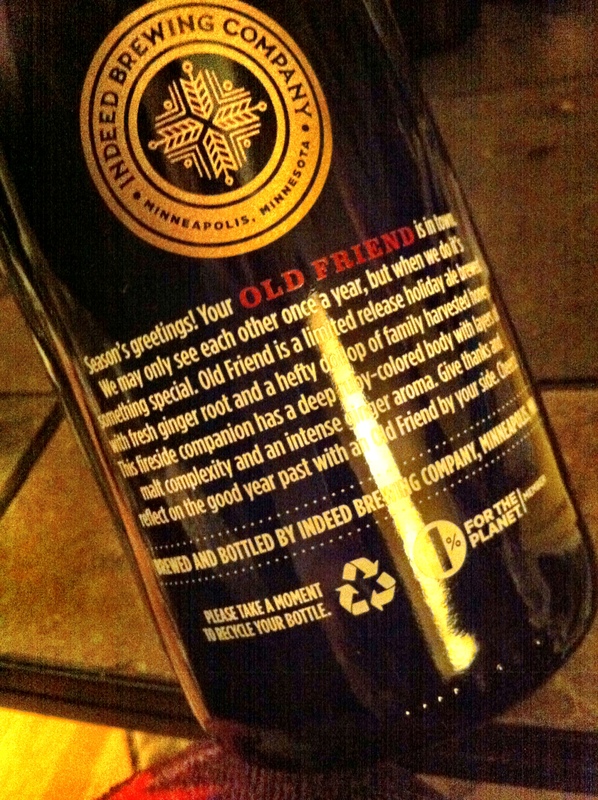 We chose our beers from Zipp’s Liquor in Minneapolis. We’d never been there before, but it had good reviews and was just minutes away from Parka, where we enjoyed Rob’s birthday dinner. There was a pretty decent selection. 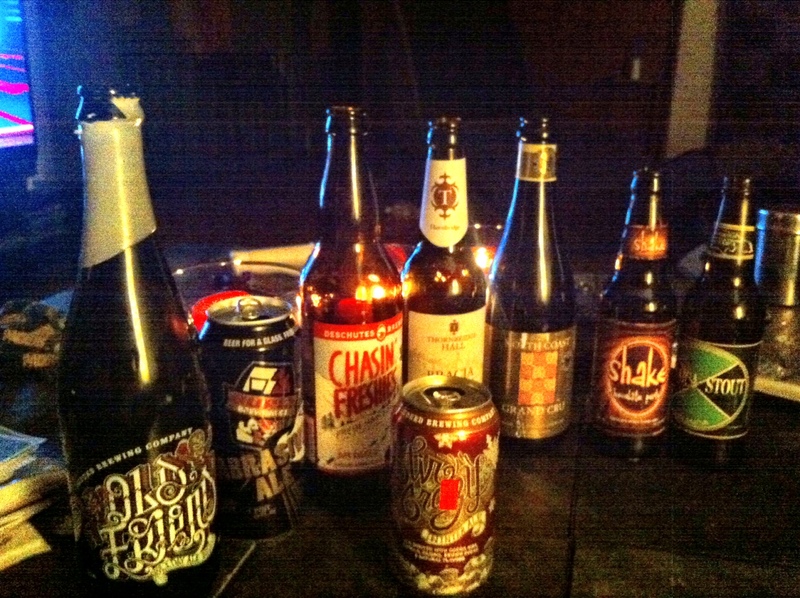 We chose about 11 beers, knowing full well that there would be no way we’d finish them all. But we wanted a variety to choose from when we finally sat down to sip. Before I present these beers to you, I would like to point out that although I feel sort of snobbish about beer, I can’t really describe it. I read reviews on Beer Advocate and Rate Beer and sometimes get lost in the descriptions, as if it’s written in a foreign language. Now I understand how people feel when I try to describe wine! Still, I can describe beers at a basic level. I know the difference between ales and lagers. I can describe beers as hoppy or malty and can pick out the coffee and/or chocolate characteristics in porters and stouts. But I still have a lot of evolving to do. Maybe those of you new to beer can appreciate my simplistic reviews. Keep in mind that there were also no real rules to the order in which we tasted. This would make me cringe if I saw someone tasting wines in the wrong order! So I’m sure some of you will cringe when you hear about the order of these beers. But just humor us. Mkay? I chose to crack open this one first because I actually was thinking a little about order. A hoppy IPA would work much more nicely before any porters, stouts or bourbon barrel fermented beers. We were interested in this one because it was made with Amarillo Hops – something neither of us had had before. We are huge IPA fans. Although I think my days as an IPA fanatic are coming to an end. It’s those bourbon barrel fermented beers that have been capturing my heart as of late. And I don’t even like bourbon. Anyway, this beer = not my cup of tea pint of beer. It had a strange aftertaste to me. So much so that it was the first beer in a long time that I dumped out. Sure, I probably would have finished it if I were in a restaurant. But we had just started Ale Fest and I knew there were a lot more beers to go. I wasn’t going to waste the alcohol on this one. Okay, so yes, we have had this one before. But it’s not often on tap. And Rob said he rarely sees it in cans. He snatched it up, as it was the last single left. We are a huge fan of Surly Brewery. In fact, it’s all because of the Surly bill that we have so many craft breweries and taprooms in Minnesota now. I actually find DIPAs smoother-tasting that IPAs, despite the higher alcohol percentage. Of course, this one didn’t disappoint. YAY, Minnesota! However, I was a little disappointed. Sometimes I forget how subtle the flavors are in English beers. Drinking all the local American microbrews lately, I’ve hardly had anything English in a while. It was a very, very good beer; but I think I’d spend my $18.99 elsewhere next time. Well, you can’t judge a book by its cover, because I just a tad disappointed. It was very good. But I think I’ve been spoiled by the bourbon barrel beers I’ve had at Steel Toe and in Temecula. C’est la vie. First world problems. It was pretty good. And unique. You can definitely taste the ginger. I’d order it on tap if I happened upon it. 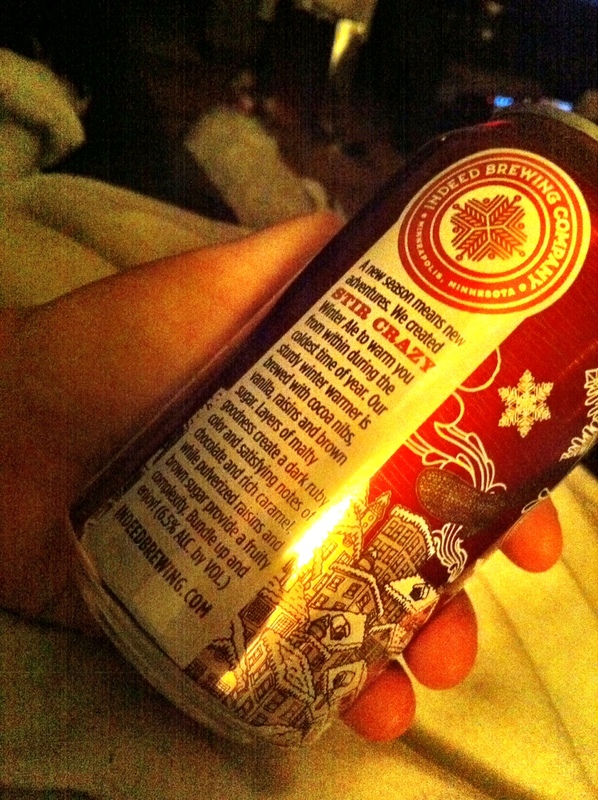 But my #1 fave from Indeed Brewing is still their LSD. 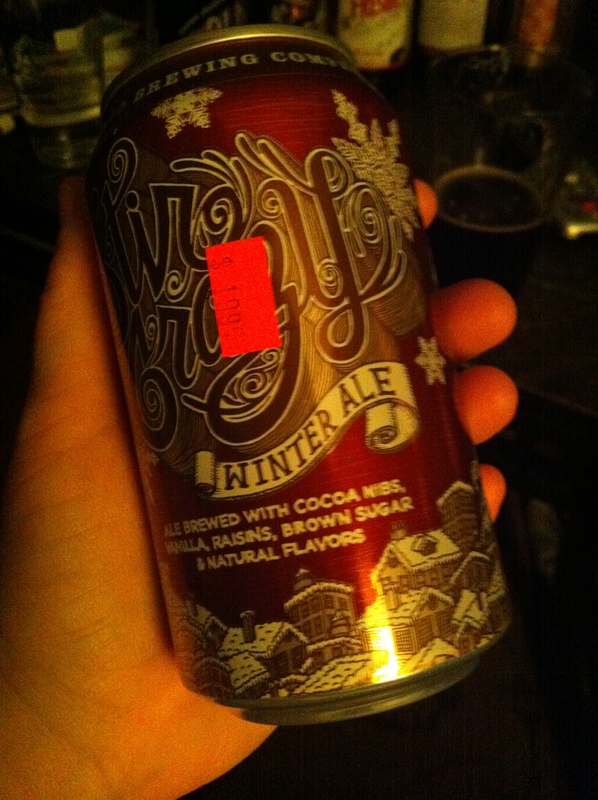 Okay, so the sticker right on the can reads “$1.99,” but our receipt reads just 65 cents for this can. Considering that we were charged the $15.99 for the full 4-pack of Surly when we only got the single, I will be a little more careful watching the ring-up at Zipp’s next time. I have to say that I like the Stir Crazy. I have since ordered it on tap, too. But the “rich caramel” description is stretching it a little, in my opinion. This beer tasted just like a chocolate shake! YUM! Yup, that’s all I’ve got. Apparently, we opened this. I don’t remember it. Rob said we liked it. I can hardly think I wouldn’t. 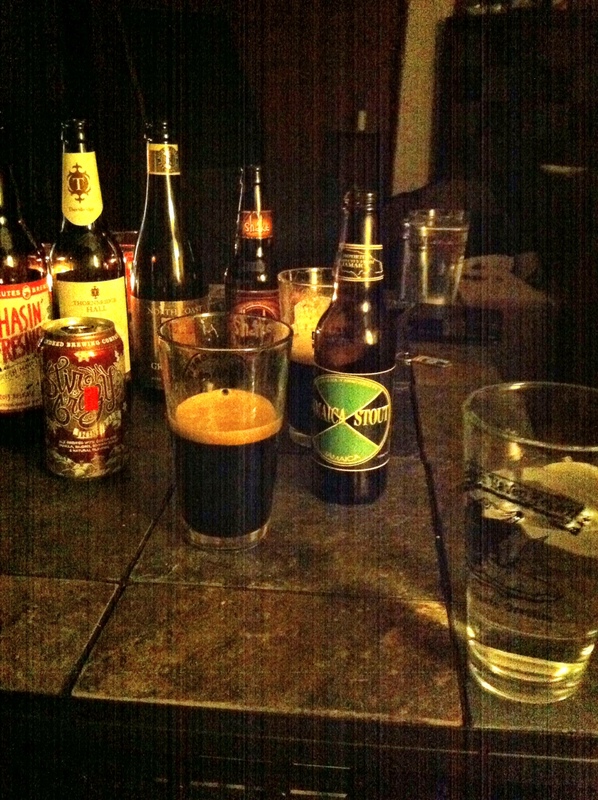 I enjoy most stouts. In any case, I’m sure I’ll still be enjoying every last sip. Tell me about a unique beer or beverage you’ve tried lately. I’m pretty basic when it comes to beer- just a lite beer for me (I know, the horror!) I recently had DeBonne’s Razzberry Riesling that was pretty good though! Just catching up on my blog reading! Love that you had Ale Fest 2013!! I love all kinds of beers, but sadly, my husband – given the opportunity to pick between 30 beers on tap would ask for a Miller Lite. The only time he gets anything else is when Boddington’s is on tap – which happens to be at an Italian restaurant of all places 2 miles from our house! Love it! Love your little slip up above, too. I read the whole thing. Not surprised you juxtaposed words. I would too. Hope all is well. I totally missed that Danae! Good catch. I think I’m going to leave it, even. LOL! How fun!!! This is such a creative idea! I’m not much of a beer drinker (wine is more my thing haha) but my boyfriend and I do “beer dinners” with a group of friends, where everyone brings a dish and a beer to pair with it. It’s a fun way to try a bunch of different things! I love that! 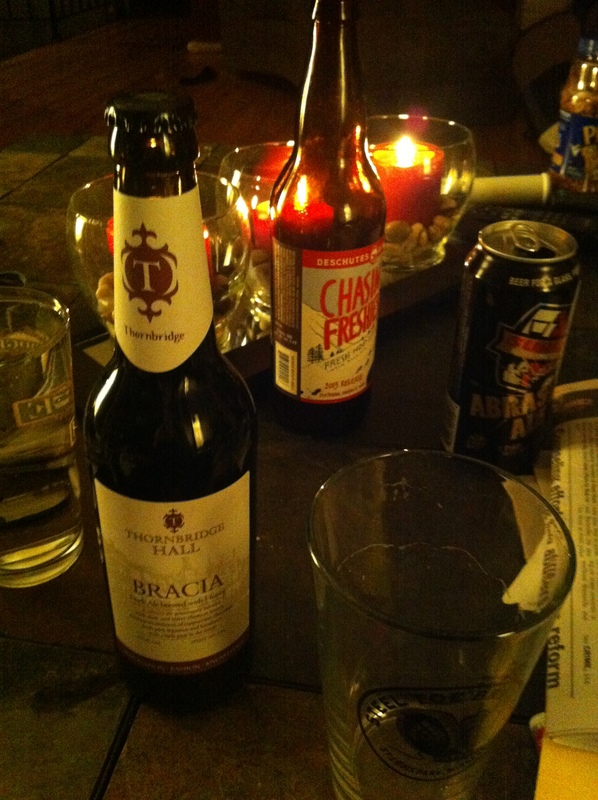 I am so bad with beer pairings that I want to do one of those beer pairing dinners some time. Fantastic line-up! A great variety and some nice local choices. Pingback: Day Block Brewing | Season It Already!